Another TV network foray into advertisement on metrocard. 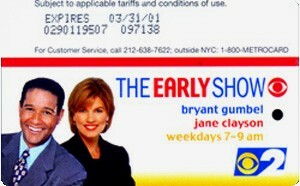 This time it is CBS Channel 02 with The Early Show with Briant Gumbel and Jane Clayson. 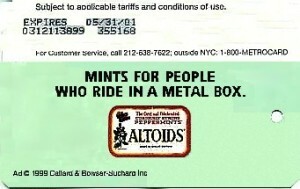 This card is an advertisement for Altoids mints. It features iconic image of top of tint box of altoids mints. 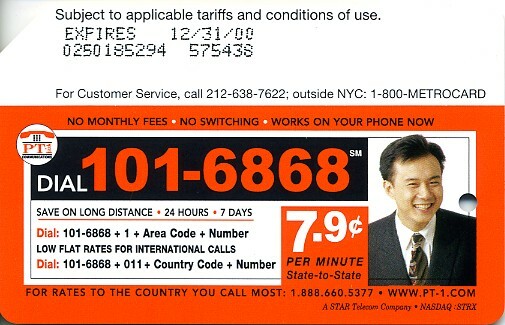 This is very rare metrocard with circulation of just 10,000. 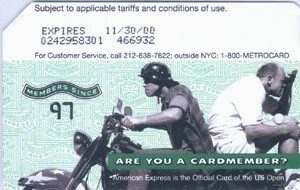 It was sponsored by American Express and was given to its employees at Christmas time of 1999. 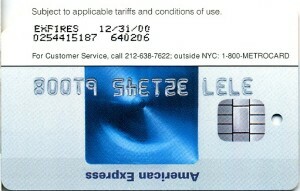 It has never been sold at any of MTA booths or authorized retailers. Each card has been stamped on the very top where there is legal statement from MTA: Subject to applicable tariffs and conditions of use. 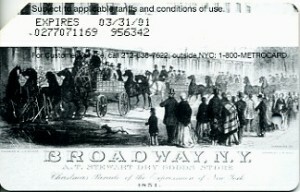 Card is black and white and features image of Broadway, N. Y. A. T. Stewart dry goods store Christmas parade of the Expressmen of New York, 1851. 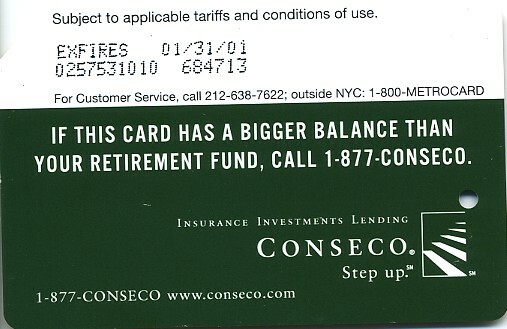 This metrocard so-called upside-down features advertisement from American Express to promote new credit card BLUE with chip inside. It had circulation of 1,000,000 and many different expiration dates. It has also 2 different versions of slightly different colours. 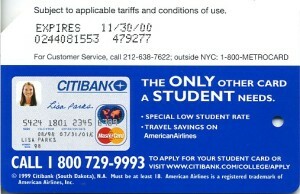 card a student needs. 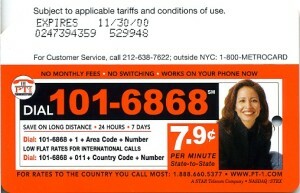 Metrocard features MasterCard image with Citibank logo and had circulation of 700,000. Dial 101-6868 set contains of 4 metrocards and advertised long distance calls from company www.pt-1.com. 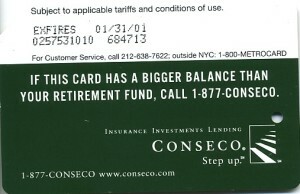 Each card was sold separately and there are many different expiration dates for each in the set. 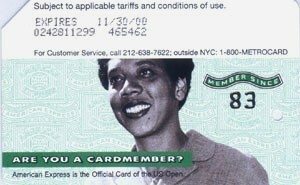 Each card features portrait of a person of one of the main races in New york: African-American (woman) circulation of 500,000, Asian (man) circulation of 625,000, Hispanic (woman), Caucasian (woman). 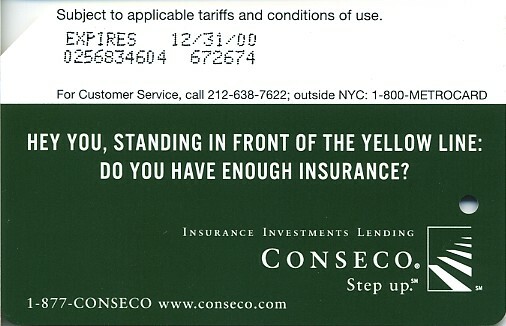 Conseco Insurance company set of 3 metrocards issued in 1999 with circulation of 1,000,000. Each car was sold separately and there are know cards with different expiration dates. All cards have dark green background and message printed on top. 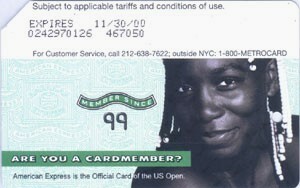 In 1999 American Express continued to sponsor issue of metrocards to commemorate US Open Tennis tournament. This year there were 4 cards altogether with each circulated of 75,000. Each card has a slogan: Are you a cardmember? Cards featured John McEnroe, Althea Gibson, Venus Williams, Luke & Murphy Jansen. 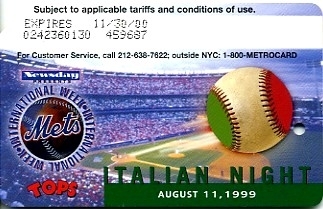 In August of 1999 Newsday and Tops appliance and electronic store (it is out of business in nowadays) sponsored 6 metrocards set together with Mets Baseball team. 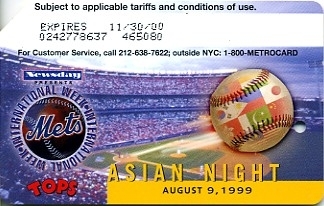 That series suppose to promote so-called International week at Shea stadium. 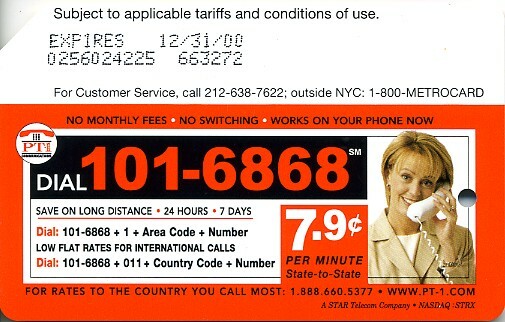 All cards were sold simultaneously at Tops stores each card wrapped in plastic with $6 encoded into it. All cards feature image of Shea stadium and baseball painted into colours of respective nation(s). All cards had circulation of 50,000. Cards include Hispanic Night, Irish Night, Jewish Heritage Day, Asian Night, African-American Night, Italian Night. 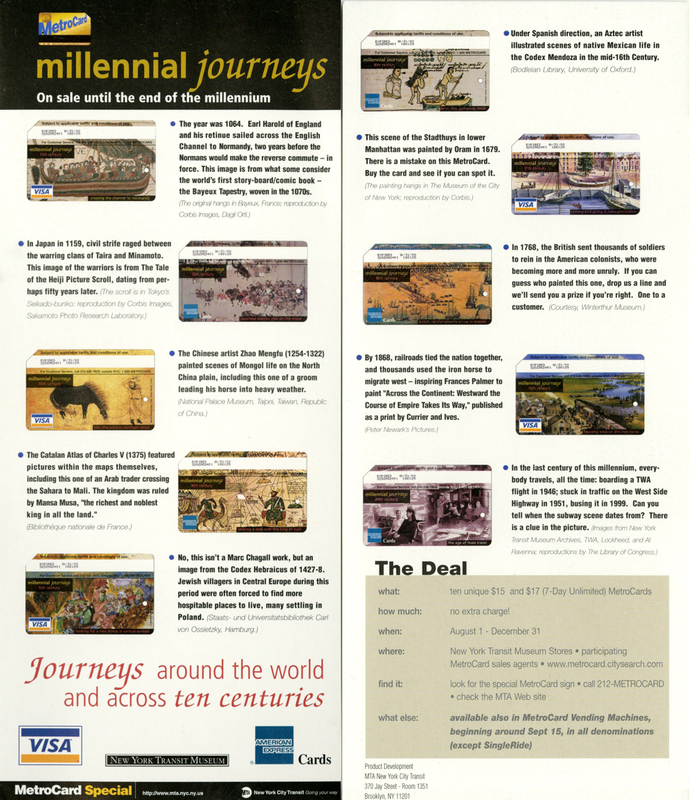 In August of 1999 MTA started to issue Millennial Journeys series of special metrocards to celebrate upcoming new millennial. 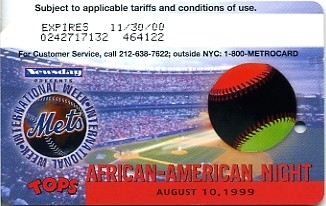 There are actually 2 series of this metrocards: one sponsored by VISA and American Express with alternative showing of their respective logos on lower left corner of the card and another without any logo. 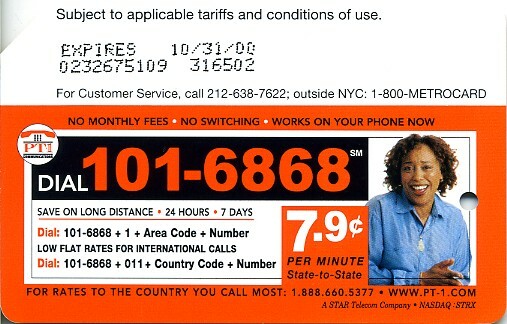 Metrocards without logo were sold at booths on many subway stations, metrocards with logos mostly were sold out of metrocard vending machines (MVM). And not to be outdone MTA in the end issued collector edition of this series in plastic folder (see inside and outside view of that remarkable folder) with metrocards without logos, all cards in the folder were encoded with monies: 6 cards were $4 one day unlimited and 4 cards were $6. Also some of those metrocards were sold as an inserts into clear plastic metrocard holders mostly 19th and 20th centuries metrocards appeared in those holders. 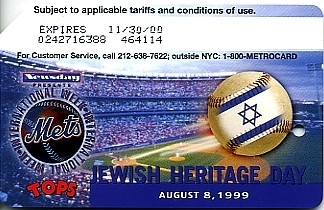 All cards without logos had circulation of 200,000. Circulation of cards with logos varies. This series was heavily promoted in subway stations, subway cars and in newspapers. 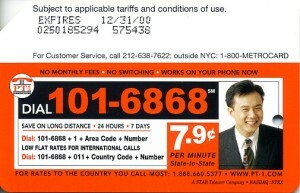 Also MTA issued leaflet. 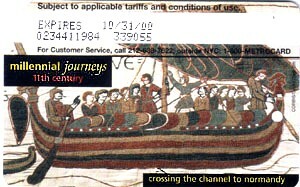 11th Century metrocard shows image of the Bayeux Tapestry, woven in the 1070s. Accompany leaflet says about it: The year was 1064. Earl Harold of England and his retinue sailed across the English Channel to Normandy, two years before the Normans would make the reverse commute – in force. 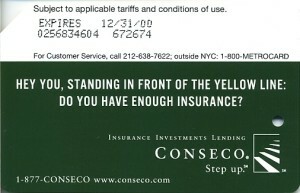 Circulation of this card with logo is 372,000. 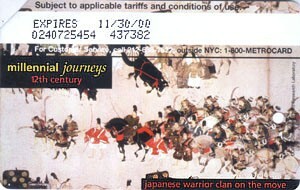 12th Century metrocard shows Japan in 1159 civil strife raged between the warring clans of Taira and Minamoto. This image of the warriors is from The Tale of the Heiji Picture Scroll. 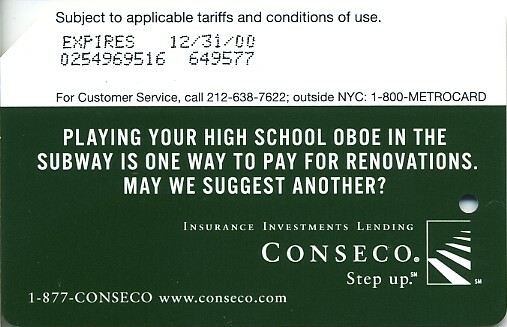 Circulation of this card is 246,000. 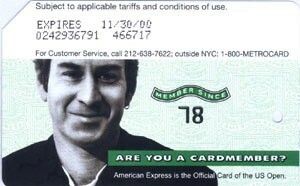 Metrocard has been sponsored by American Express. 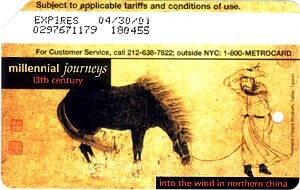 13th Century metrocard shows scene by Chinese artist Zhao Mengfu of Mongol life on the North China plain, including one of a groom leading his horse into heavy weather. Card with logo was sponsored by VISA. 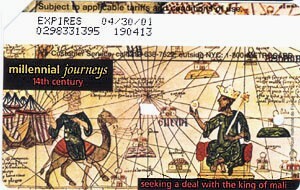 14th Century metrocard shows Catalan Atlas of Charles V (1375) and pictures of Arab traders on top of it. 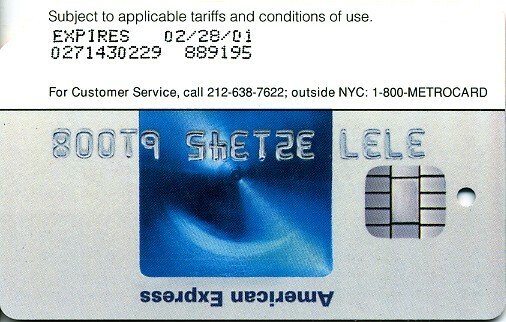 Metrocard with logo was sponsored by American Express. 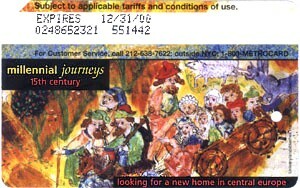 15th Century metrocard shows an image from the Codex Hebraicus of 1427-8. It is very similar to work by artist Marc Chagall. Metrocard wit logo was sponsored by VISA. 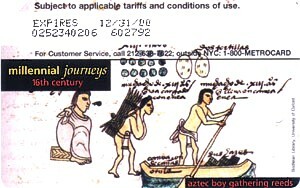 16th Century metrocard shows image by Aztec artist of scene of native Mexican life in the Codex Mendoza in the mid-16th Century. 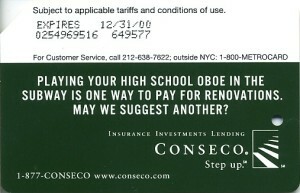 Card with logo was sponsored by American Express. 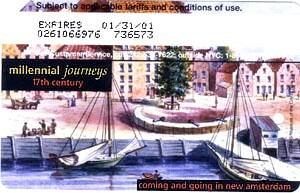 17th Century metrocard shows painting by Oram with view of the Stadthuys in lower Manhattan in 1679. 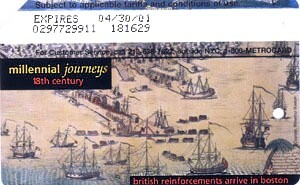 18th Century metrocard shows British troops in 1768 sent to rein on American colonists. 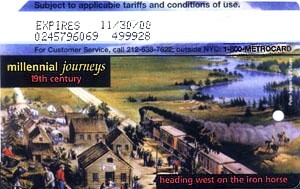 19th Century metrocard features painting by Frances Palmer of railroad and train going Westward. 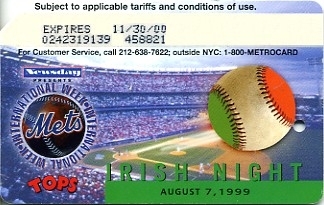 Card with the logo was sponsored by VISA. 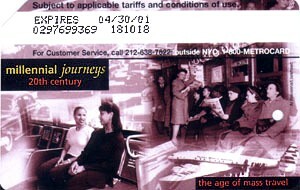 20th Century metrocard features images from 20th century mass transportation: TWA flight in 1946, traffic on West Side highway New York in 1951, busing in 1999 and scene from subway car. 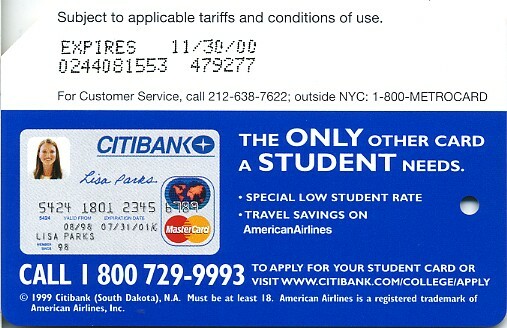 Card with logo has been sponsored by American Express.